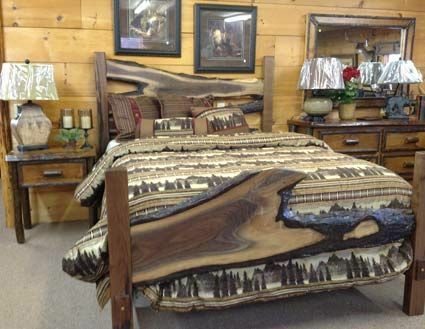 Welcome to Jerry's Mountain Furniture. We offer everything you'll need to furnish your mountain abode. As natives of the Blue Ridge mountain area, we know how enchanting the mountain lodge home decor is and we specialize in offering products and services to help you design your Mountain Home Dream. If you are in the North Georgia mountains or surrounding areas we invite you to visit our showroom locations in Blue Ridge and Blairsville Georgia where you find on display complete home furnishings. In addition, we offer rustic building materials from our sawmill and shop at Jerry's Unique Wood Creations and full turnkey interior design service with Interiors by Charlotte. Or, you can buy a piece of heaven from our on-line store. We look forward to helping you design your Mountain Dream Home .